Makeup Revolution is a brand that I have loved since they launched. 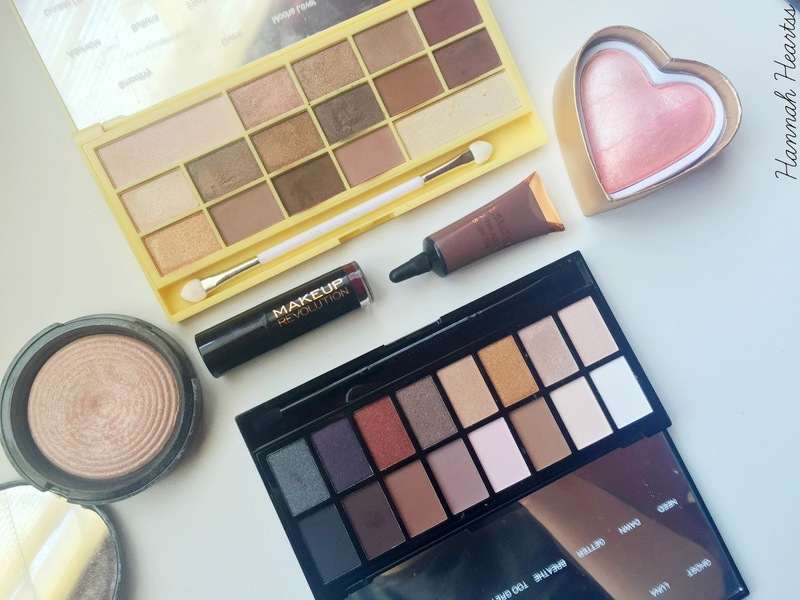 As soon as they launched and I saw people talking about them on twitter I made an order and slowly over time my Makeup Revolution collection has grown and I have found some products that I am completely in love with. These are only a few of my favourite products from Makeup Revolution but trust me there is many, many more! Makeup Revolution know what they are doing when it comes to their eye shadow palettes. I picked two of my favourites out of the many that I have in my collection which are actually two of Makeup Revolutions new releases. The Naked Chocolate Palette is the perfect everyday palette with a mixture of mattes and shimmer shades. You can really create any day or night look with this palette which is why I love it so much. Not to mention how incredible the packaging is, it looks like a chocolate bar! I have also used a couple of the shades to do my eye brows if I forget my brow products and I actually prefer to use these shades than my actual brow products! The second palette I have been really enjoying using is the Iconic Pro Palette 1. This is, I believe, a dupe for the Lorac Pro Palette. It has incredible pigmentation with a row of matte shades and a row of shimmer shades. The shimmer shades are amazing, so pigmented and such a beautiful range of shades from light to dark. For brows I love the Ultra Aqua Brow Tint. It is so pigmented and a little goes a very long way with this product. It fills in my brows so well and it is such a great shade for my eye brows. It lasts all day on my brows and doesn't budge. I wore this swimming a few months ago and I made sure not to rub them or anything and they looked like I had just applied it even after I got out of the pool. This tint is going to last me forever because I only use the tiniest amount! For the cheeks I have currently been obsessed with the Blushing Hearts and the Radiant Lights. The blushing heart in Peachy Pink Kisses as been on my cheeks so much since I got it and I love it. It is very glowly and gives a lovely peachy glow to my cheeks. I find that when I use this blushing heart I don't need a highlighter as it is like a two in one product. The Radiant Light in Exhale has been loved so much since I got it towards the end of last year. There is three shades of the Radiant Lights but Exhale is my favourite. I apply it too the tops of my cheek bones and it gives me such a lovely glow without looking like a disco ball. My final Makeup Revolution pick is the lipsticks. At £1 each you really can't go wrong. My favourite shade that I have is Rebel with Cause. It is so creamy and so pigmented that you can either wear it too its full intensity or sheered out for a more day time look, I love it both ways. There is so many different shades of lipsticks that there is bound to be a shade or two that you fall in love with. What are your favourite products from Makeup Revolution?